Having worked on non-canonical SPARS — called dangling modifiers (or danglers, for short) on Usage Street — for several decades now, my files of SPAR examples have piled up alarmingly. I’ve cited a fair number of the examples in my postings on danglers (see the Page on this blog on dangler postings), but in line with general urgings to make data sources publicly available wherever possible, I’ve now posted the files here as a Page (where, like the dangler postings Page, I can update it regularly). The subjectless adjunct in the boldfaced material has both a PRP VP (lying on its side) and a PSP VP (sunk into the taller grass) in it, and picks up (the referent of) its missing subject, not from the subject of the main clause (by the Subject Rule, as in a default SPAR), but, apparently, from the direct object in that clause. Nevertheless, unless you cleave unswervingly to the Subject Rule, you shouldn’t find the boldfaced sentence problematic, and there’s a reason for that. At issue is the interpretation of the PP = after + NP here, after a long day at school; the grammar tip presupposes that this PP is, in my terms, a SPAR, a subjectless predicative adjunct requiring a referent for the missing subject — I’ll refer to this as the Referent (for the SPAR) for short — in which case general principles predict that the missing subject is the dog, which is both the nearest NP to the SPAR (the Nearest Rule) and the subject of the main clause the SPAR is adjunct to (the Subject Rule). But PPs with the temporal P after don’t generally count as SPARs; only certain ones do — those with an NP object denoting a time span (as above) — and then those SPARs are subject to the complexities of interpretation that attend all SPARs, according to which factors of syntax and discourse context come into play (making the Subject Rule only a default and not a hard constraint). This is Superintendent Bill Hall calling to wish everyone a very happy, healthy, and safe Thanksgiving break. I would also encourage you to go to our website at http://www.mtsd.org and watch the video regarding our District’s recently released ranking for our Pennsylvania Value Added Assessment Scores. After watching the video, I know you will be proud of your child, our teachers, and our District. Interesting how effortlessly we retrieve you as the missing subject of the adjunct despite its position in the complement clause. The initial phrase (italicized above) after watching the video, call it (1a), would be deprecated as a “dangling modifier” by many — but as Josh noted, it is effortlessly (and correctly) interpreted as having the addressee of (1) (and not the speaker of (1)) as the person watching the video. (X) A nine-year-old boy is being hailed a hero for saving his mother’s life after being struck by lightning. Merriment ensued on the mailing list over the boy’s impressve act, his toughness, and the like — all these responses indicating that readers interpreted (X) as asserting that the boy performed his heroic act after he had been struck by lightning. The phrase after being struck by lightning is a SPAR (a Subjectless Predicative Adjunct Requiring a referent for the missing subject), and virtually everyone reading the phrase in the context above will take the required referent to be the referent of the subject in the main clause (a nine-year-old boy), rather than the referent of an NP closer to the SPAR: his mother’s life, an unlikely candidate, since that referent isn’t even a concrete object that could be struck by lightning; or, better, his mother, surely the NP the writer of (X) had in mind as supplying the required referent. If the writer had absorbed the lessons of their school grammar, they would in fact have expected that the boy’s mother would be supplied as the required referent — because that school grammar tells you, very firmly, that a SPAR will (indeed must) pick up its referent from the NP nearest to it (the Nearest Rule). (That’s not the way school grammars, and books of usage advice, talk about these things — they speak of nouns and dangling modifiers — but here I’ve cleaned up the deep conceptual confusions in the traditional way of talking about these things.) Unfortunately, the empirically more adequate general principle isn’t a Nearest Rule, but a Subject Rule (and even that’s just a default, not an inviolable law of grammar). drawings and sequential images are structured in a similar way to language … comics are written in a visual language of sequential images that combines with text. I haven’t read the book yet (though I find the thesis congenial), but the very first sentence (in the Introduction, p. xv) is of linguistic interest. Why is this so hard to process? At the same time, the first sentence introduces the British Museum and the Palace of Westminster, implicitly (but quite subtly) introducing the Members of Parliament as entities in the discourse, though probably not as the topic. 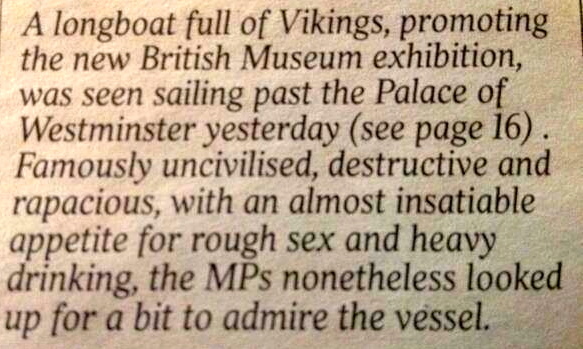 Then we get the second sentence, which is clearly about Vikings (uncivilized, destructive, and rapacious), not boats (or the Members of Partliament, for that matter). 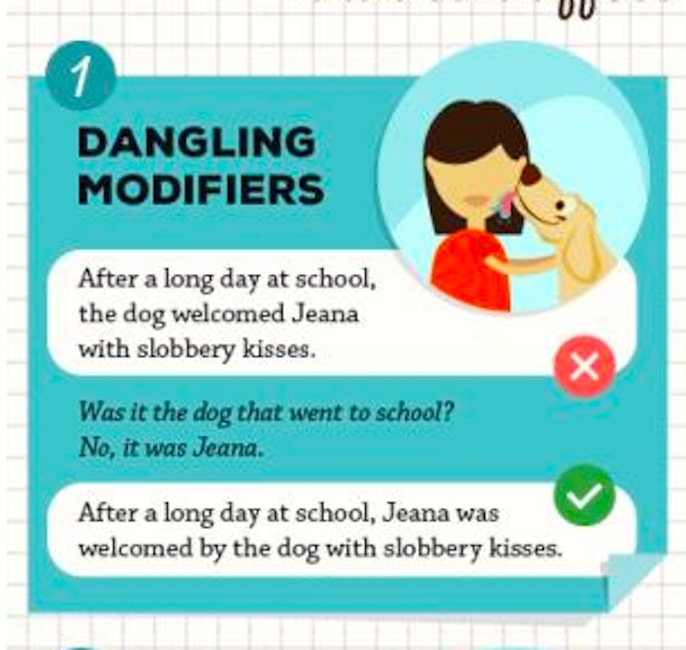 A regular theme on this blog looks at “dangling modifiers” that on no reasonable grounds should some of them be treated as ungrammatical. Here are two cases, of different types. Today is the 10th annual National Punctuation Day, a high holiday on nerd calendars across these great United States. Its stated purpose is to be a celebration of underappreciated, misused marks like the semicolon and “the ever mysterious ellipsis.” But a better-known piece of punctuation has been getting some apocalyptic press and deserves attention on this day of celebration: the apostrophe. Back in January I looked at a racy dangler in final position in its clause, where the referent for the missing subject was picked up from a combination of the subject of the clause and an oblique object in the clause; the antecedent was split between two different elements in the clause. Now this morning in a KQED Perspectives column by Steven Moss (“Transformation”), another split-antecedent dangler, less racy and now in clause-initial position. You are currently browsing the archives for the Danglers category.